Bugatti says the Galabier 16C concept takes some inspiration from the legendary Type 57 Atlantic. Bugatti has unveiled a concept sedan that points the direction the luxury automaker wants to head once production of the Veyron ends. 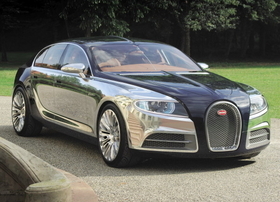 The Bugatti Galabier 16C concept is one vision of a sedan that Bugatti wants to have in production around 2013. Under the hood is the 16-cylinder engine used in the Veyron. But the four turbochargers have been ditched in favor of a pair of superchargers. The concept also is equipped with all-wheel drive and an automatic transmission. Bugatti's goal with the Galabier 16C is to build the world's fastest sedan. Similar to the Veyron, the Galabier 16C makes extensive use of carbon fiber to reduce weight. But the concept's doors are made from aluminum. The concept seats four people and puts an emphasis on luxury, not sportiness. Bugatti says the styling of the Galabier 16C is inspired by the curvaceous Type 57 Atlantic, built in the 1930s.